No, this is not a poem about the tiny cabbagehead. It’s a short note about this particular cruciferous veggie and how it had suffered injustice in the hands of too-eager cooks. 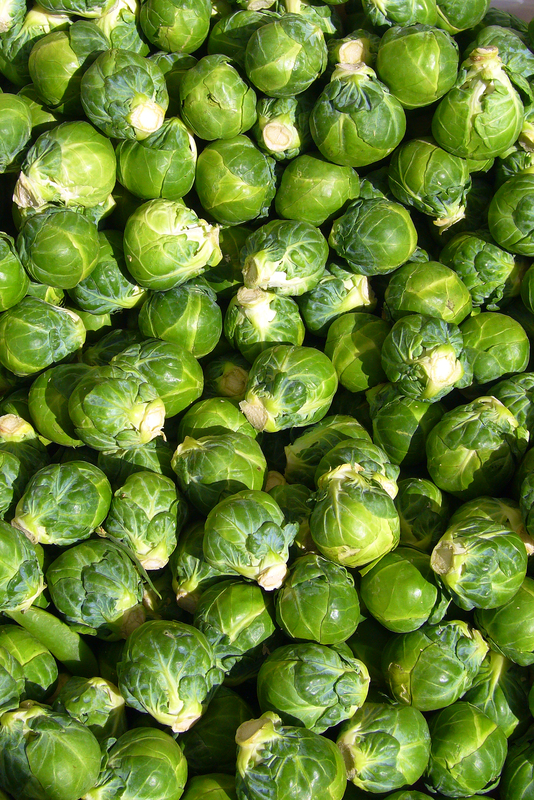 Brussels sprouts have been described in not so flattering terms as a detestable vegetable in terms of texture and taste, as stereotyped by kids hating the stuff more than broccoli. And this stereotype only exists in the Western side of the world, as it is very rare (or even nonexistent, as far as I know) in Asian cuisine. How can something so tiny and cute be so maligned in pop culture? One word: overcooking. This little one is soooooo easy to overcook. This tiny veg has sinigrin, which is responsible for the disagreeable taste of overcooked sprouts (it gets degraded in high heat, splits off from its sugar molecule…and did I tell you that it has a sulfur atom or two in its structure? Hence the smell and taste). But…its propensity to be easily overcooked is a plus for a harried grad student–this only means that it has an absurdly short cooking time, so whipping up a simple leafy side dish (or a main) is just under 8 minutes of cooking time (go past it–ugh!). Here’s one treatment of this veggie that I did, without looking for an actual recipe. My kitchen philosophy lately is–grab whatever and go. – Blanch prepared sprouts in boiling salted water for 2-3 mins. or until the heads turn bright green. Pour in a colander and cold-shock the batch with cold running water from the tap. Drain well. – Heat peanut or coconut oil in a big frying pan or wok (medium high). Toss in minced garlic until it turns light golden brown and the garlicky smell is apparent. – Toss in the drained sprouts. Season with salt and pepper. Stir-fry them for 2-3 minutes, or until they are lightly coated with hot oil and garlic. – Drizzle with black sesame oil, toss and remove from heat immediately. Cooking time. When you do the math, the total cooking time is 6 minutes, tops. That’s little under 8 mins, after which you’re past the point of no return and the veggie turns into something hateful and a complete waste of time and resources. Cold-shock. This is a measure to ensure that the veggie is not overcooked. Sprouts are notorious for storing heat in their compacted leaf-heads, so even though they’re drained from the blanching liquid, the heat will cook them from the inside. As you may notice, I did not score the bottom of the sprouts before blanching–damaging the veggie in that manner increases the risk of overcooking. Might as well cut the sprouts into half before blanching, so you’d get to see how the inside looks while cooking. Peanut or coconut oil? And what’s RBD? Peanut oil is actually tasteless. And can withstand high heat without getting degraded. Coconut oil is better–that is, RBD (refined, bleached and deodorized) coconut oil because it doesn’t degrade into trans-containing oil at high heat and is bland. Using a mild, bland oil brings the natural flavor of the key ingredients (sprouts, garlic, sesame) to the fore. Properly cooked sprouts taste–? Wonderful. Au naturel, it has a pleasant nutty flavor to it, which complements well with the aroma of fried garlic and sesame oil. The bitterness is absent, or, if you choose to focus on it, a very minor note that gives an earthy dimension to the dish. I like pairing this dish with a simple main one–like pan-grilled sausage, or a serving of well-aged chicken-and-pork adobo. And lots of rice, of course. Oui, you can pierce the Brussel sprouts once you cut off the stem head. That will speed up the cooking.